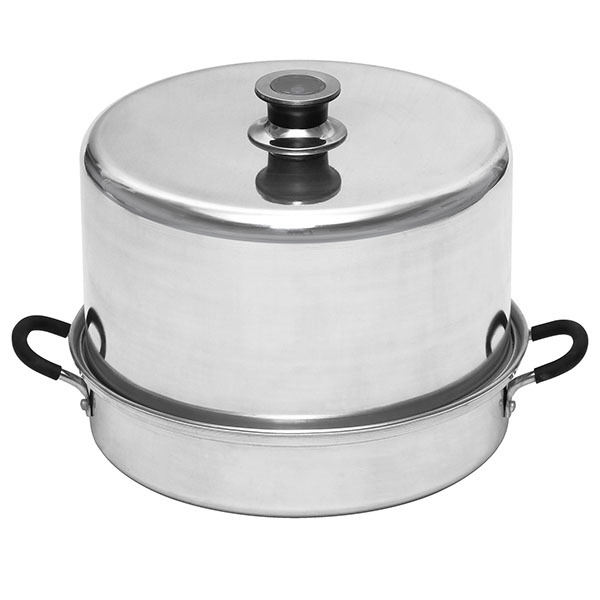 This is the Steam Canner I purchased. It can only be used on coil electric, or gas burners, no flat top. There is another model they sell, suitable for flat top stoves, but not this one. This entry is mostly an info-note to self about my new steam canner. When I tested it, as suggested in the manual, by canning four 1 litre jars filled with hot water, and watching the gauge, one of the jars cracked on the bottom. I began at a 6/10 heat on my burner, I never go higher than 7/10 because my pots are heavy and don’t need a higher heat, nor do they benefit from a higher heat. I waited until the lid rumbled a bit and steam forced it up a bit, then checked the gauge reading, lowering the heat to 4.5/10, which provided a full rolling boil and a steady, strong stream of steam. I thought that perhaps a bit higher heat was desirable. When I made my first batch of Crabapple Jelly, two 500 ml jars, I heated the water in the canner to a boil, added the jars, then turned the heat down to 4.5/10. This was again, a full rolling boil. Only one of the two jars sealed. When I made Crabapple Jelly this morning, eight 500 lm jars, I heated the water in the canner slowly at 3.5/10, added the jars, left the stove temperature at 3.5/10, waited until the gauge indicated it was up to heat, then set the timer. After waiting five minutes after the heat was turned off, the jars were removed from the canner and set out on a towel on the counter. Within five minutes the first five jars sealed, after fifteen minutes one more sealed, and within a half an hour the last two sealed. My conclusion is that on this stove, I will preheat the canner at 3.5/10 heat, and leave the stove at that temperature for the entire canning process. The reading on the gauge need only come as far as my elevation minimum, no more. I am 278 feet above sea level here, so these are the settings that I will use going forward, with this canner, for this location, and on this stove. The Crabapple Jelly is delicious. The Crabapple Jelly recipe used is from the National Centre for Home Food Preservation, but I made one change. Instead of processing for 5 minutes, I processed for 10 minutes. The reason I did this is that jars would need to be sterilized for processing times under 10 minutes, so by processing for 10 minutes I was able to eliminate the extra step of sterilizing the jars and lids. 1 peanut butter and jelly foam sandwich, down the hatch, yum! Yay, no frost here last night! The garden will keep going for a few more weeks, so more tomatoes, peppers, basil, and beans on the way! Crabapples from the back yard. They are small and hard and tart, tart, tart. They have many blemishes, and a few bugs. Most of the bugs float away when they are washed, I don’t worry much about bugs. The blossom ends were cut off, and the whole apple, stems and all, were added to the pot, to be boiled for several hours until all the flesh from the apples dissolved. These Crabapple are on our property and have not been fertilized, or sprayed with insecticide, or paid any attention whatsoever. since we bought the property in 2010. I consider them organic, non-gmo, and pretty darn healthy. The second batch of crabapples are boiling on the stove. This week was a busy one! There is a volunteer apple tree in the back yard at Mist Cottage. It is probably a crabapple tree, the apples are about half an inch to an inch in diameter. Attila figures they would be much larger if the tree were pruned, which is hasn’t been, ever. Two quarts of the apples were boiled this past week, the pulp strained through a clean cotton cloth, and the juice made into jelly. Two 500 ml jars of jelly were the result. The only ingredients were the crabapple juice and sugar. The jelly set well, and it is delicious, just like my Granny used to make. 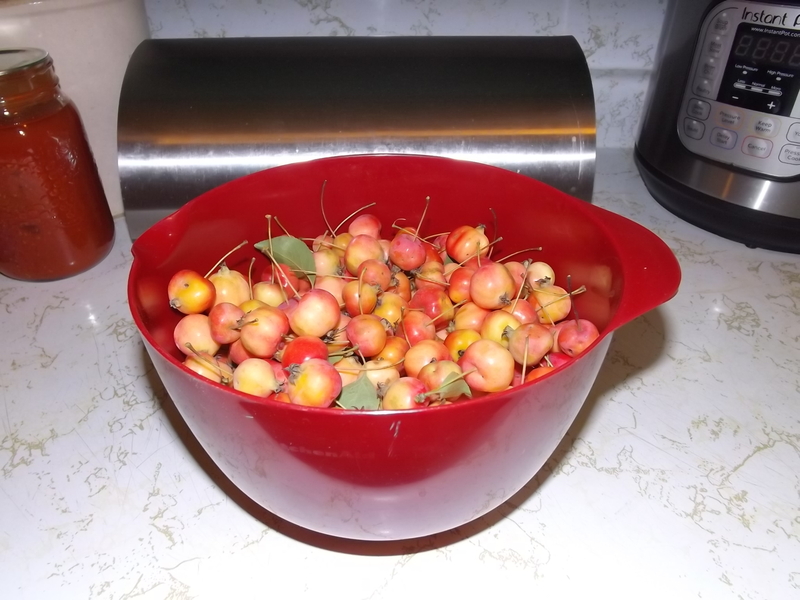 This evening Attila picked about four more quarts of crabapples, they are on the boil right now. Since we spent our vacation working away on our projects here at Mist Cottage, we decided that it would be appropriate to treat ourselves to a new chest freezer. It arrived last week. Of course it was yet another dominoes situation. The wall against which it was to be placed was bare concrete, with a studs framed-in over it. I decided I wanted it insulated before placing the freezer there. Attila volunteered to do the work, insulating with Roxul, then sealing it with vapour barrier and tape. He got that done the day before the freezer arrived. The freezer delivery was interesting. It barely fit through the doors, and the delivery fellows decided the doors had to be removed to get it into the house. Myself, and Attila, both feel it would have come in without taking the doors off, but these fellows had their heart set on taking them off, so off they came. Then the fellows felt the flashing around the exterior door should be removed. I grabbed Attila’s tool bag, found a screwdriver and removed the flashing for them, and put it back on again after they got the freezer into the house. They set the freezer up, installing the casters at my request, the casters were optional, so I felt they were good sports to install the casters for me. It was a hot, humid day, so I made sure they had cold beverages in their hands as I waved them goodbye. Organizing the freezers is now my domain. Attila has always wanted to do it, has always done it, but I decided I want to do it, and he decided that maybe that would work. I am much more organized than is Attila, and am now on a mission to organize the frozen food. It is slow going! When we moved in just over three years ago the frozen food was hurriedly stuffed into the freezers, after having been transported via a five-hour truck ride. The frozen food has remained a disorganized jumble since the move. The other addition to our kitchen is a steam canner. After seeing one demonstrated on YouTube, I did some research. They weren’t recommended by the USDA when I bought my hot water bath canner, but only because they had not been tested and their safety was unverified. Testing was conducted and the findings published in 2015, now they are approved by the USDA. I’ve always used hot water bath canning for high acid foods, but I feel steam canning is a more practical way to do the job. So in addition to the freezer, we purchased a steam canner. I am now climbing the learning curve with the steam canner. It arrived yesterday. The first step was to wash it. The next step was to test the gauge, by canning four one-litre jars of water. To my surprise, I lost my very first canning jar, one of them cracked! It didn’t shatter, held the boiling water until I could get it to the sink, and was still hanging together when I placed it in the recycling bin. Today I made the first batch of Crabapple Jelly, two jars. Only one of the jars sealed! This is not a problem I have ever had before, so it is surprising. I cannot account for the failure. It doesn’t matter so much in the case of the jelly, because it will be consumed soon enough, jelly keeps quite well in the refrigerator. I will be making another batch of Crabapple Jelly in the next day or so, and it will be interesting to see if I get good seals with my jars in the steam canner. This morning was cold and dreary, raining off and on. And then the sun came out and the day transformed. It was warm and lovely. Oh how nice it would have been to have had a few days like this over the summer! There is a frost warning for tonight though, so the beans, peppers, basil, nasturtiums, marigolds, and tomatoes are all covered with plastic sheets for the night. Fingers crossed that we don’t get frost! Or if we do, that the plastic sheets do their magic! Tonight: Low zero with patchy frost.